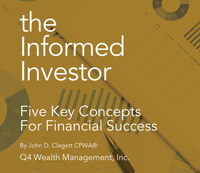 Is Q4 Wealth Management Right for You? The word wealth has its origins in the old English term “weal,” which means well-being or prosperity. Your well-being is the compilation of your successes, failures, aspirations, values, and lifestyle. We believe realizing greater well-being requires sound planning guided by understanding the needs and dreams of our clients. This is why it’s essential your wealth manager is someone who listens and connects with you, and is fully committed to you and your goals. If this resonates with you, we encourage you to go on a Discovery with us to get a first impression and learn how we can help grow, enhance, and protect your wealth. It starts with a conversation, not a questionnaire. Together, we identify your financial goals through the lens of your values, needs, concerns, and dreams. After we’ve developed a plan to help meet your goals. Then we come together again, and in clear terms we’ll explain each component of the strategy. If you choose to move forward, we do just that. If you choose not to or need more time, that’s ok too. It’s your wealth and your decision. Whether you meet with us or talk with another advisor, we feel it is important to be educated and empowered about your financial well-being. This prep sheet will help you prepare with a few self-reflecting questions as well as essential questions to ask. Learn the five key concepts for financial success to see through the noise of the marketplace and make smarter decisions about your money.